Remodel of an early 1960’s Santa Monica, California kitchen was designed to capture a timeless, yet functional space. The first thing to tackle was the spatial relationships to make the kitchen more functional for this small family. The existing refrigerator was moved to the adjacent wall and surrounded by the utility closet and pantry, creating a built-in look. This allowed us to build one long countertop and create a “furniture hutch” look on one wall. The base cabinet houses the trash/recycle bin on the left and the litter box is concealed in the right end cabinet. Choosing a free standing range and a microwave that is built-in, in an upper cabinet, created more countertop space on the cooking wall. The sink was kept on the diagonal in the corner so that the shelf behind it can be used to display art pieces. The Saarinen marble table is the centerpiece for an area that is wrapped with a medium turquoise painted bead board wainscot. New molded wood chairs complete the look. The serene colors of white, light turquoise and dark brown are timeless, while the stainless appliances, hardware and pendant light fixture add some sparkle. The white cabinets are warmed by the rich chocolate tone of the large porcelain tile floor. The sleek countertops are a toast-colored Caesarstone, selected for durability and ease of use. 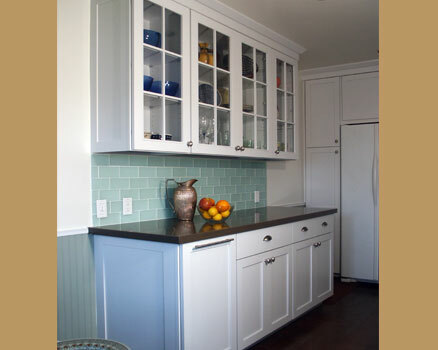 Glass subway tiles keep the backsplash subtle and contribute to the kitchen’s warm, casual feel.